Golden Ninja Warrior Chronicles: Curse of the IFD THUNDERBOLT series 10: Scorpion Thunderbolt Original korean-taiwanese movie on tape discovered!!!! Curse of the IFD THUNDERBOLT series 10: Scorpion Thunderbolt Original korean-taiwanese movie on tape discovered!!!! Scorpion Thunderbolt is indeed one of the favourite IFD movies for almost all the fans around the globe. Not only the only horror-fantastique episode in the Thunderbolt saga, but in opinion of many die-hard collectors ( among them Jack J) the best IFD movie ever, Godfrey Ho's masterpiece. It seems this movie has "something" that makes it so special! During many years I have been searching information about the original movie IFD used to create Scorpion Thunderbolt, while checking the credits & the style, everything pointed that it was a taiwanese production. It was not a bad search direction since IFD used a lot of taiwanese movies on its ninja films & they also released a lot of those Taiwan Black Movies in the early 80's...but I was partially wrong since Scorpion Thunderbolt was made re-editing a korean-taiwanese co-production titled GRUDGE OF THE SLEEPWALKING WOMAN (Mongnyeohan, 1983). You check more details about the movie here. I eventually found out the origin of Scorpion Thunderbolt & what movie was used to design it, but the most difficult part was still a challenge: Was GRUDGE OF THE SLEEPWALKING WOMAN edited on tape somewhere??? Is it still avaliable? Could we enjoy it some day?... Well check the pic below to get the right answers!!! As you can see GRUDGE OF THE SLEEPWALKING WOMAN was released on tape somewhere in Asia, May be Hong Kong? May be Taiwan? May be anothe chinese spoken language country? but the amazing thing is a 4th generation copy of this movie is avaliable with english subtitles at www.rarekungfumovies.com. 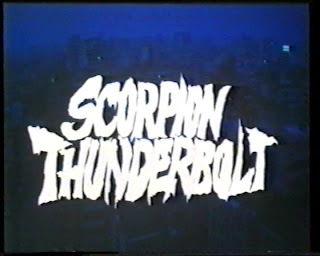 Now we don't have an excuse to complain about how we wish you could enjoy Scorpion Thunderbolt on its original cut & even subtitled!! !